Labrador Retriever puppies are hard to resist when you're looking for a new companion. It sounds simple enough. You go to the breeder or pet store and pick which puppy you want to take home. But just how on earth do you make a choice when confronted by a litter of adorable little Lab pups? Of course, human nature being what it is, you will probably develop a liking for a particular puppy very quickly. It may be the way the Lab pup looks at you; the way he wrinkles his nose or the enthusiastic way in which he licks your hand. Whatever impression he makes on you the best time at which to buy Labrador Retriever puppies is when they are around eight weeks of age. Take note how the different pups in the litter react to your presence. A young pup which is aggressive will more than likely be aggressive as an older dog. By the same token a puppy which is withdrawn from his litter-mates and shy will probably remain timid. You should try to choose a puppy that likes to play, wants attention, and enjoys your affection. But, no matter what the initial impression a pup makes it is vital to ensure that the puppy you are thinking of taking home will be as healthy as possible. Don’t be reticent about checking the puppy over in front of the breeder. You should carefully examine puppy with particular attention being paid to mouth, eyes and ears. A pups teeth should be clean and straight and the eyes should be clear. If you can see lines or white spots on the puppies eyes it is highly likely that he will develop eye problems later in life. Also inspect the pups ears. They should certainly be clean but they must be free of odor. Any smell coming from the pups ears is very bad news and the pup should, unfortunately, be rejected. You’re physical inspection should also ensure that the pups legs are straight and watch him move to make sure there are no signs of lameness. Feel the pups stomach for signs of swelling which could indicate worms and make sure he is well proportioned for his weight. The last thing to inspect is the parents pedigree papers and lineage; ensure that both parents are well bred, have no history of producing poor litters and are not closely related. 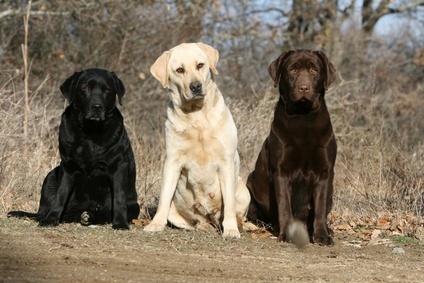 If Labrador Retriever puppies pass all those criteria then what are you waiting for? Take him home as soon as you can!